Ryan seeks out small mines and rare veins of stone in travels that have taken him far afield. 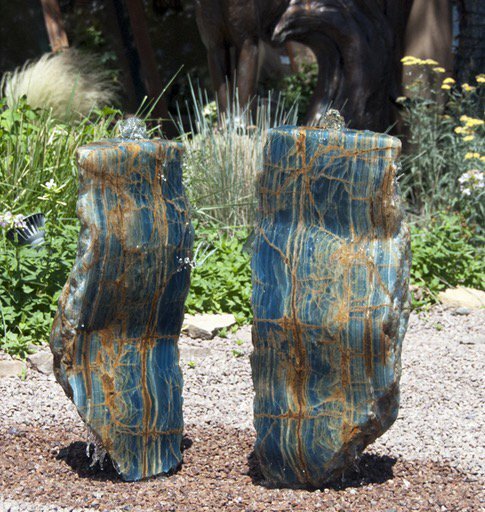 In Argentina he discovered Aquamarine Onyx. This stone is obtained from mines at an elevation of over 15,000 feet. The story goes that the Argentinian government decided to build a high-altitude through the mountains. As they were blasting the mountain, they discovered a deposit of absolutely magnificent blue stone. This stone has become a signature stone for Steffens and one of his most popular in part because the stone is rare and difficult to obtain in the larger sizes the sculptor requires. The stone is mined by hand and transported by pack animals in the first leg of its journey.